short video about our club. scroll down for details of upcoming events. Weather forecast for Government Camp on the right. See bottom of this page for ski area reports. Click on the image here to see this very colorful magazine. Learn all about past and upcoming Far West events, the annual Convention, winter trips, and more. See what other clubs and councils are doing..
Click on each 2-page spread to thumb through the rest of the pages. 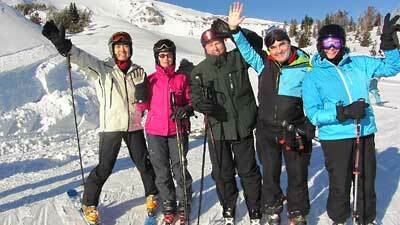 Ski Trips survey. We need your opinions. 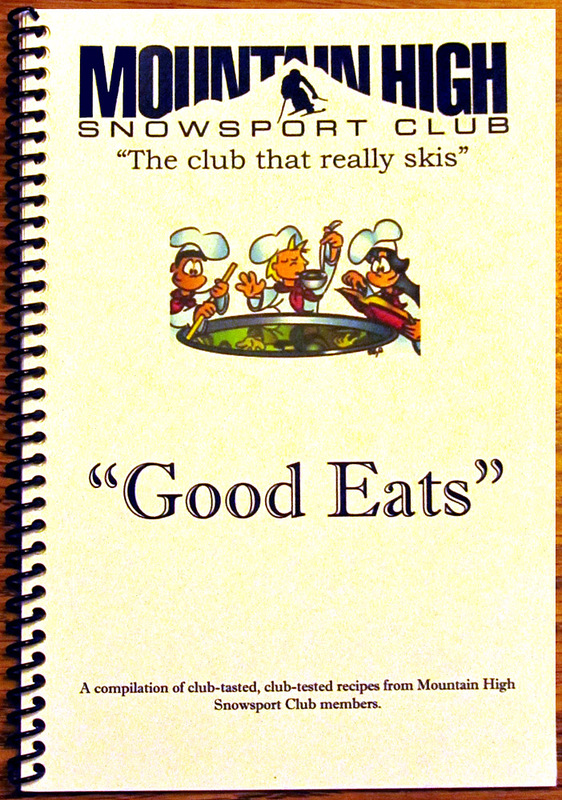 Please participate in this 14-question survey about our club's ski trips. Tell us your trip preferences and help us to shape future club trips. We set up an online survey using Survey Gizmo. If you get a privacy or security warning, that is simply due to your own security settings, which might be too strict. Feel free to ignore any such alert for this survey. But, if you feel uneasy about the online version, feel free to fill out the same survey by printing the Word document or PDF file and mailing it to us. THANKS! Our club provides numerous activities in the following categories. 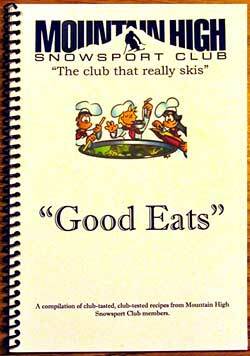 b) Ski trips to other ski areas in the West -- see TRIPS page. c) Recreational racing – RACING pages. d) Social events, parties, etc. – on the HOME page. e) Summer activities (Biking, Hiking, Rafting, Picnic, etc.) – usually on our HOME page. To fully understand what our club does, please see a whole year of past photos on the PHOTOS page. 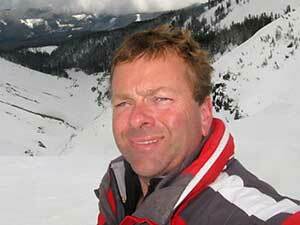 Kenny Brundidge, our club's mid-week skiing coordinator, has died in a tree well accident at Mt. Bachelor, on Friday, March 1, 2019. He was skiing west of the Sparks Lake Run, in terrain served by the Northwest Express lift. He fell into a tree well and suffocated. His companions waited for him at the bottom of the lift. When he didn't show up, they went back to the area they had just skied to look for him, but didn't find him. A couple of snowboarders found him a short time later, but he could not be revived. Our condolences to Kenny's wife, family, and friends. Kenny was a great guy and an excellent skier. Everyone liked him. We will miss him. Saturday, March 23rd at 3:00 pm. Let's ski together! Join for an informal fun day on the slopes! 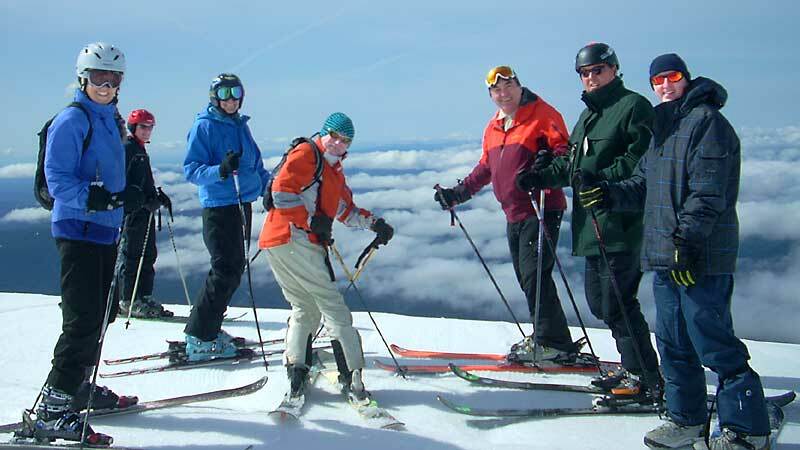 Our weekend skiers tend to go to Timberline and/or Skibowl. Our mid-week skiers usually go to Meadows on Thursdays or whenever there is some fresh powder. How to connect with us? See the weekend & mid-week entries on our TRIPS page. Click on our two FORUM buttons in the menu and see who is going skiing and when. Participate in the discussions! See our Facebook page, where all our members can post their own messages and often invite others to come ski with them. Start by clicking on the Facebook button in our main menu. We have always encouraged carpooling from Sandy, and that is still an option. But, now you can take the new Mt. Hood Express bus instead. For only $2 (or just $1.50 if you prepay for 20 tickets), you can ride the bus from Sandy to Skibowl, Government Camp, or Timberline. Catch the bus right on Hwy. 26, at a park and ride bus stop half way between Champion Way and 362nd (which is the Fred Meyer traffic light in Sandy). Turn into Champion Way to park at the Information Center. The most convenient bus starts at 7:45 am and arrives at Skibowl at 8:32 and at Timberline at 9 am. Click here for the complete schedule. 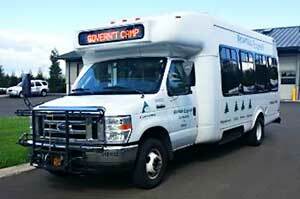 Also note that Timberline runs its own hourly shuttle between Government Camp (stopping at the Mt. Hood Brewing Co., at Collins Lake Resort, and at the Chevron station at the top end of Govy). This shuttle runs only on weekends and holidays. Approximately once an hour to make the full round trip. Those 71 and over pay only $50. 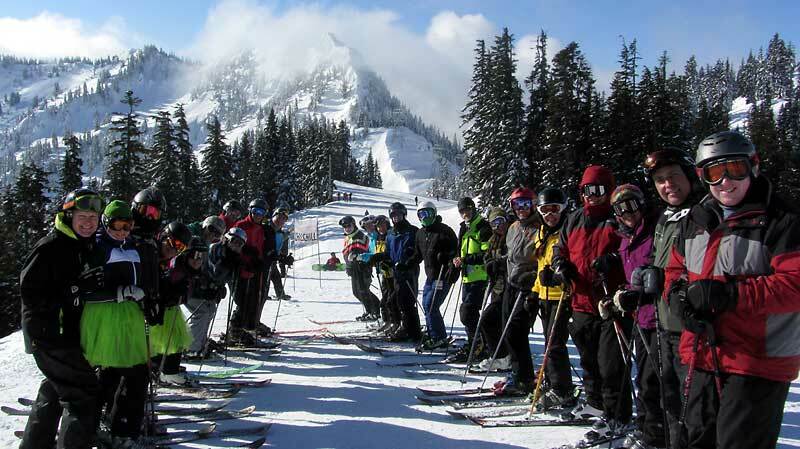 NWSCC Trips - NW Ski Club Council and other local ski clubs. FWSA News Flash - November 2018 issue. 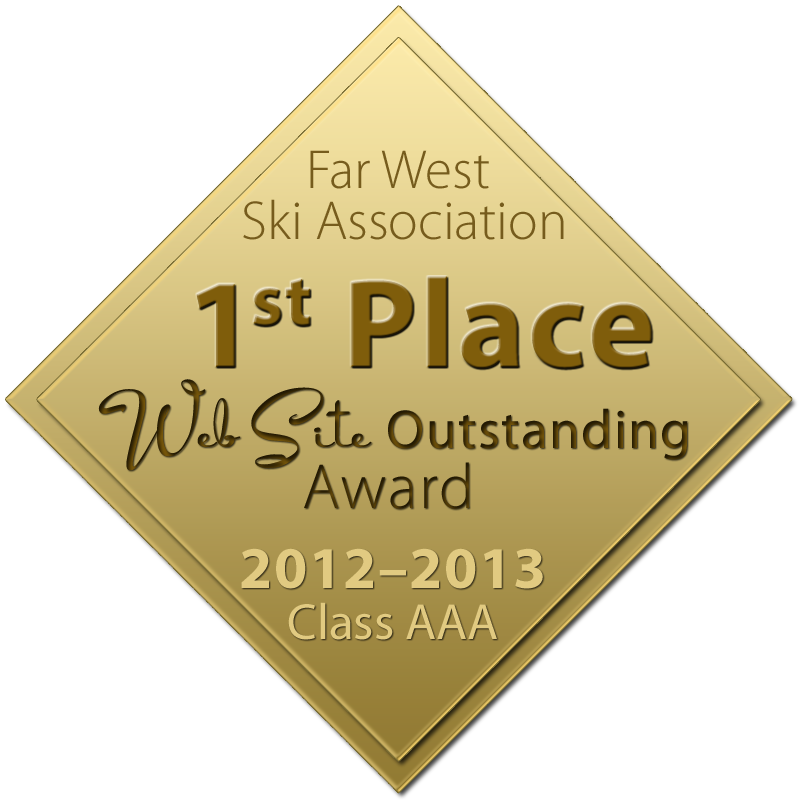 Far West Ski Association Newsletter. Trips, Racing, Ski news, and more. Special Discount on Meadows 10-time pass. A special deal for all local ski clubs associated with the NWSCC. Get a 10-time pass to MT .Hood Meadows for just $399. )Regular price is $449.) Just click on the heading of this announcement. Barlow Road field trip photos are now posted on our PHOTOS page. A video will also soon be added there. Season Passes compared. Compare the cost and benefits of various lift ticket passes. This was first published on page 8 of the September issue of Lift Lines (#177). It is now on our Articles page. Ski Fashion Show at the Mt. Hood Museum & Cultural Center in Government Camp. See video of this fun event held on March 31, 2018. It shows vintage ski apparel from the 1930s to the present day, including several garments currently available for purchase at Hillcrest Sports in Gresham, Oregon. Man and Woman of the Year. Our 2018 man and woman of the year are: Bill King and Debbi Kor. Congratulations! They are also our current Vice-President (Bill) and President (Debbi). See our Awards page for a list of past men and women of the year and other awards. Please send us your nominations for Man & Woman of the Year for 2019 (by October or early November 2018). The best way to get info about ski areas. The updated page contains almost all the ski areas in the West, 170 of them. It's the easiest way to get info for a trip. Just click on whatever ski resort you want. Also find info on heli-skiing. Also available on our Ski Areas page is an Excel Spreadsheet continaing a list of all the ski area in Norrh America. You can use it to track te places you have skied. Latest Photos are now on our PHOTOS page, including pictures from the whole past year. A group of us skis more or less regularly mid-week at Mt. Hood Meadows. Come join us. See details below. A group of us skis more or less regularly on weekends att Timberline Come join us. See details below. Road trip, Skiing some hidden gems. Kurt Wilke and Emilio Trampuz went on a 4-day road trip to ski some small and hidden gems in eastern Oregon and Washington. See this video of their adventure. Photos from our whole past year will soon be moved from the Photos page to a new Photos 2018 page. Our Photos page will be cleared to make room for new photos for this coming season, starting with the SkiFever Show and the Kickoff Party.. Just keep scrolling down the photos page to see all our past events. Skiing North America - An article about our club member John Andrew skiing all of North America has appeared in the Wall Street Journal on March 20, 2016. See here. Meet at McDonald's in Sandy 7:30 am. We can carpool, or just drive up together. Some of us are going to Timberline or Skibowl. Others are going to Meadows. We can all meet at McDonald's. See details about our day trips on the TRIPS page. Hey, a day trip is a trip too! If you have a 2-way radio, tune it to channel 6-19. Go to our Bulletin Board and print the special coupon for the adidas employee store, fill it out and get a 50% discount. Thanks to our member Elsebeth Frank for offerng this. See the new video about what our club has been up to lately. Included is a funny snow report about the upcoming Whitefish Mt. trip. Membership renewal. Please renew your club membership in the Fall (September, October, or early November). This is also the best time to sign up for a ski trip with the club. It is best to renew in person at the annual Ski Fair or at our annual Kickoff Party. If you do it by mail, simply print print the Dough Transmittal form and mail it in. You can find it on our Membership page and on the Forms & Docs page. Teams are being formed in October and November, and many teams need a few new team-mates. Camaraderie, fun, racing, après ski parties and more! Check it all out on our Racing page and on the PACRATs web site. Member Benefits updated - 20% off at the Taco Shoppe Thanks to Kevin Bastin, owner of the Taco Shoppe and a Mountain High club member, we have now been offered 20% off of any item on the menu (not just the burritos). But only 10% discount during the summer months. The Taco Shoppe is located in Government Camp, across the street from the Huckleberry Inn (but a house or two up the road), or just downhill from the Mount Hood Museum. See details on our Membership Benefits page and on our Bulletin Board page. Click here for see their full menu. Color code: This color code is valid until you use the links. The viewed links will then change color, due to your browser's settings, but the dates will still remain the original color. See more event details in the next section below. 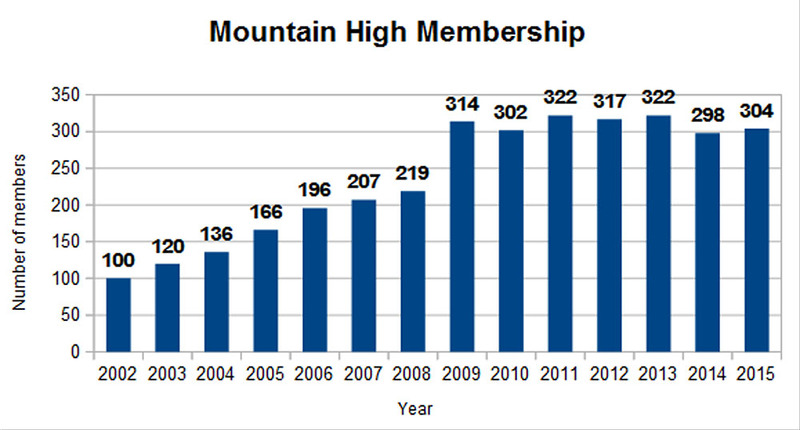 Club membership has steadily increased from 2002 - 2011, and has stabilized around 300 since then. Current membership as of September 2015 = 304. Last Monday of the month, we meet at the Round Table Pizza 10070 SW Barbur Blvd., Portland (near the corner of Capitol Hwy.) to plan future club events, trips. Phone: (503) 245-2211. If you would like to get a bit more involved with the club, please come and join us. This is a working and planning meeting, but it's open to all. Social gathering: 6:00 pm, and the meeting starts at: 6:30 pm. Representatives of local ski clubs gather to coordinate activities, plan joint events and trips. Sometimes, there's a guest speaker. These meetings are open to all. Time: Socializing starts at 6 pm. Meeting starts at 6:30 pm.. Dates: Meetings are held quarterly on the 3rd Wednesday in October, December, March and June. Location: At various locations around the Portland metro area. See the NWSCC web site for details. Check out some of the features available on watches these days: Altimeter, Compass, Clinometer, Barometer, Stop-watch, and more. And water resistant to 200 meters. Sadly, not all in one watch. Read article. A blog set up by Drew Jackson, the weatherman at KPTV-12, writing about snow conditions from a skier's perspective. This has been added to both our Blogs and Links pages. A whole new vision of enhancing both safety and fun on the slopes. Read all about it (click on the "Vision" button. Get involved. Write to the ski areas. Write to ski magazines. Refer them to our website: www.mthigh.org/Vision.htm. Mt Hood List - A great new site! Go to MtHoodList.com to post your own message, to find a carpool to Mt. Hood, to find buddies for a Meadows 4x4, or any other Mt. Hood related activity. Check out this content on our site! c) Skis for sale on our Bulletin Board! What did you do this past winter? Where did you ski? Where were you 20 or 30 years ago? How did you learn to ski? Any spectacular falls? Any embarrassing moments? Send in your personal short stories or reminiscences. Please add a photo of yourself or the people in your story. Digital photos are most welcome. Printed photos will be scanned in and returned to you. Contact Emilio. Free or half-priced lift tickets. In the Forum, post your questions, requests, offers, or help provide answers. For plain text announcements or questions, feel free to post your own message in the Forum. For more elaborate, announcements, including graphics, photos, etc. please email them to us at info@mthigh.org and we'll post it on the Bulletin Board. We know you have something to contribute to the club. Organize a party, a hike. a game of cards, a visit to the theater, or just a TGIF. Take your favorite activity and invite other club members to join you. Just let us know what you could do for the club. Or, better yet, come to our monthly planning meeting, any last Monday of the month, at the Round Table Pizza. 2-way Radios on the slopes! Connect with other club members on the slopes. 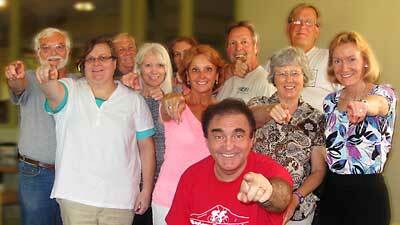 Simply get on the radio channel 6-19, and call for Mountain High members. That is Channel 6, Privacy code 19. There is a permanent note about this on our TRIPS page. The Challenge continues each winter season. It is not a competition for the most ski areas visited. Instead, everyone who visits at least 7 ski areas in the Northwest will be entered into a drawing for a prize. Just save your lift tickets or receipts from the ski areas and mail them to the NWSCC: The address is on the form. Click here for the Entry Form and Rules in Word or PDF. Short 5 minute summary of what our club is al about. Must see! 1st place for Web site. 1st place for Outstanding Club. See more on our Awards page. Proof that Straight skis were always Shaped. Straight skis were never really straight. See proof in this video. Greg Coulter has left Hillcrest Sports to focus on Boots and More. 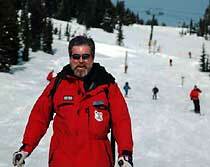 He has been involved with the ski industry for 25+ years and has chosen to go his own direction. Boots and More is service only. Boot fitting, and ski & snowboard tuning and repair. It also sells insoles and liners as well as boot accessories. The big difference between Greg Coulter and everyone else is that he will pick up and drop off the customers equipment. Contact Greg via email; gcoulter40@gmail.com, or phone 503-917-9360. Visit the Boots and More Facebook page and Like it. Also, see the BAM Performance website to find out more. A few of the best photos from the 30th annual Awards Banquet known as the "Rat Attack" have been posted on our Photos page. You can join the mid-week group and post a message in the mid-week forum whenever you plan to go up skiing and see if others can join you. More info on our "Trips" page. 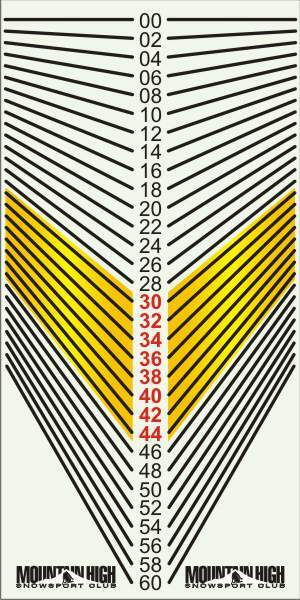 Attach this simple device to your ski pole and use it to measure the slope steepness. ShredHood.org is a web site devoted to everything Mt. Hood. It contains the latest news, classifieds, racing, new school, old school, videos, slides, events, resources. The web site was started by Ben Jacklet, a local journalist. 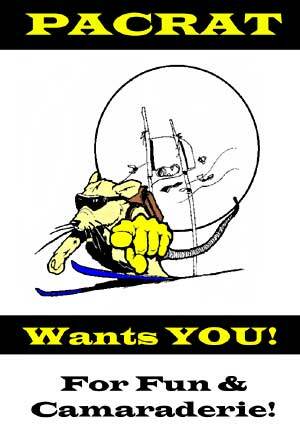 "One of our target customers is the high school/ club racer looking to maintain a competitive advantage. Racers can drop their skis off after training nights and pick them up ready to go on race day. We are currently set up to do edge tunes and hot waxes." Sat: 7-6pm and Sun: 8-6pm. Next season, they plan to stock race accessories as well. Stop by anytime. The location is on the right hand side of Hwy 26 in Rhododendron across from the Village Market. 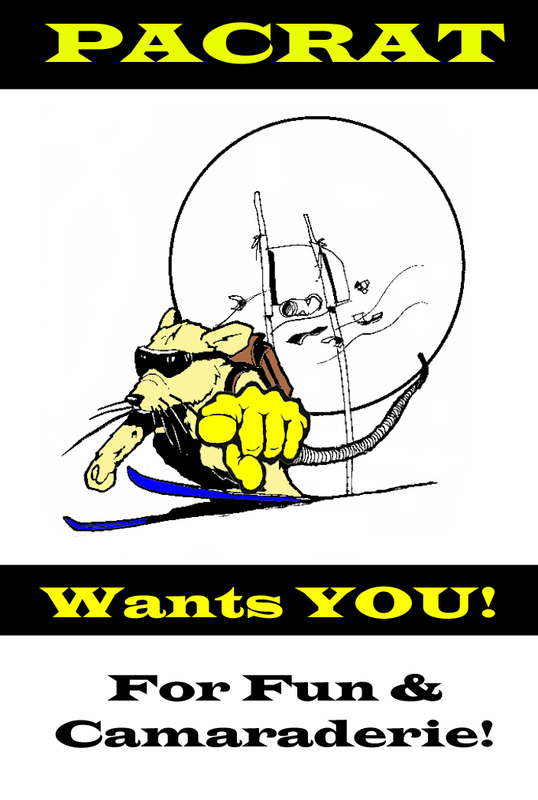 Our club now has a new page devoted just to beginner skiers, and we need volunteers who are willing to help newcomers to the sport. This is a win-win for everybody. By brining in new people to the slopes, the ski areas get more customers, our club gets more members, and the newcomers get their wings (their skis or boards)! Note: Trips and Racing events have their own pages. The events listed below are events other than ski trips and races. a) Day trips to Mt. Hood ski areas (both weekend and mid-week) – currently on the TRIPS page..
Our Home page is mainly a calendar of events and a place to post social events that don't have their own separate pages, such as Trips and Racing events do. To get a better view of what our club does, please check the ABOUT US page and the PHOTOS page, which shows almost everything we did in the past year(s). Each season, we start to build a new Photos page, so if you are checking us out at the beginning of the season, check out one of the previous year's Photos page, which will be more complete. The Mt. Hood Cultural Museum preserves and showcases the rich history of Mount Hood through interpretive exhibits and educational programming. The museum features six galleries that highlight the history of the mountain’s early exploration, winter sports, settlement and natural history. The museum, the Mt. Hood Information Center and the Museum Gift Shop are open seven days a week from 9 a.m. to 5 p.m. The museum is closed Thanksgiving and Christmas. Admission is free. A series of entertaining and informative evenings at the Mt. Hood Cultural Center in Government Camp. Be entertained and learn something new. Government Camp, Oregon. Across the street from Huckleberry Inn and about 2 houses up the road. Right next to the Taco Shoppe. 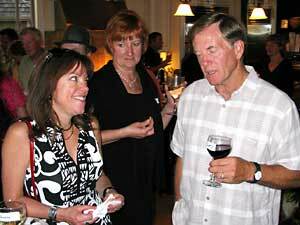 Social History Happy Hour events take place the last Saturday of the month at the museum. Topics range from Mount Hood photography to ski fashion to volcanic activity on the mountain. Learn the interesting history of the short lived Skiway tram. 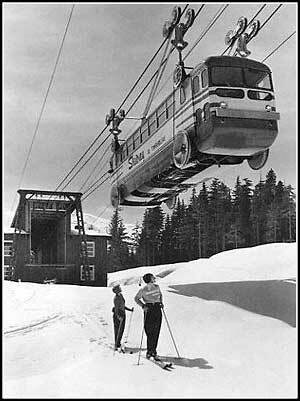 Local investors used a city bus and cable logging techniques, to fashion an aerial tram from Government Camp to Timberline Lodge. It only operated in 1951 and 1952, but the flying bus was a sight to see and a fright to ride. This event is a rare opportunity to view the best photographs in the museum's extensive collection of Mount Hood related photographs. Archivist Brittney Cardarella and Curator Lloyd Musser will share their favorite photographs from the collections of Hal Lidell, Jock Pribnow, Helen Gerding, Bill Keil, Dale Crockatt and other photographers. Annual vintage skiwear style show with models from Skiyente Ski Club. Follow the ski fashion trends from 1930's to the 2000's with clothing from the museum collection. Narrated by Sandi Shaub. The new fashions for 2020 presented by Hillcrest Ski & Sports. For more information about the lecture series, please call the museum at 503-272-3301. Click here for a PDF version of this flyer. The Mt. 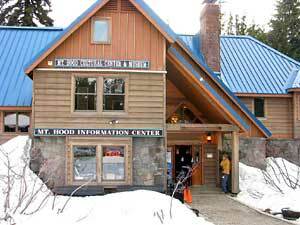 Hood Museum preserves and showcases the rich history of Mount Hood through interpretive exhibits and educational programming. The museum features six galleries that highlight	the history of the mountain's early exploration, winter sports, settlement and natural history. The museum in the center of Government Camp, the Mt. Hood Information Center and the Museum Gift Shop are open seven days a week from 9 a.m. to 5 p.m. The museum is closed Thanksgiving and Christmas. For more information, contact Janet Paulson at 503-970-3810. Once a year opportunity to ski the 3.0 mile historic Glade Trail. A full day of red carpet skiing, including groomed trail, guides, lunch, airport style shuttles, Apre's ski wine party, prizes and more. Reserve your tickets at 503-272-3301. The Mt. Hood Cultural Center and Museum in Government Camp holds this annual event on the first Saturday in March, by special permit from the US Forest Service. The historic Glade Ski Trail is opened and groomed for this participatory living history event. This once popular downhill ski trail starts at Timberline Lodge and ends in Government Camp, a distance of three miles. With multiple shuttle bus ride back up to Timberline, if you are ambitious, you can easily ski 21 miles over the course of the day. 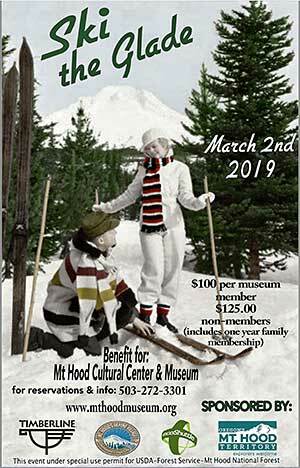 Once a year, on the first Saturday in March the historic Glade Trail is groomed courtesy of Timberline Lodge for this annual living history day of skiing the way it used to be on Mount Hood. Participants in the event receive shuttle transportation to Timberline, ski the trail with friends, and meet the bus at the foot of the trail to run back up to the top. When you’re ready for a break, drop by the museum for a hot lunch featuring homemade gourmet soups and other great foods. The day concludes with a reception at the museum that includes beverages and hor d’oeuvres. Ski the Glade is an annual tradition at the museum, held every year on the first Saturday in March. Timberline Lodge, an event sponsor, grooms the Glade Trail for the day providing great terrain for skiers and boarders. Years ago, the Glade Trail was regularly groomed, providing a long loop for skiers or a route down the mountain at the end of the day. Many people in Northwest Oregon have fond memories of days spent skiing the Glade Trail. Tickets for the all-day event are $100 for museum members and $125 for nonmembers, who will receive a year’s membership to the museum along with the ticket purchase. The price of the ticket includes use of the shuttle, lunch, apres-ski reception and a couple of beverage tickets. Only 75 tickets are available for the event. The Glade Trail was built by the US Forest Service in 1937 as part of the Timberline Lodge ski complex. The trail roughly follows the route of the original Blossom Trail, dating to 1888 or earlier. Before the advent of ski lifts, highly groomed slopes, and extreme snowboard acrobatics, skiing long trails was popular. Skiing consisted of either jumping or trail skiing. Trail skiers climbed on skis equipped with climbing skins to the Timberline Lodge area and skied back to Government Camp. Shuttles will run from 9:00 AM to 4:00 PM allowing ticket holders to make several trail runs. The events of the day are recounted at the Apres ski party, where prizes are awarded. Wearing vintage ski clothing is encouraged. Participation is limited to 75 skiers. Tickets may be purchased at the museum, or by calling 503-272-3301. Visa is accepted. For more info see: www.mthoodmuseum.org. Photographs from past years events are available on the website or upon request. The event director is: Lloyd Musser, 503-367-3946. 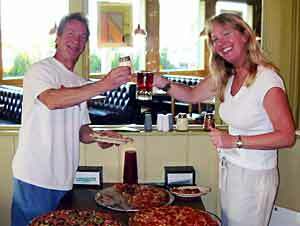 Gary and Alice enjoying the pizza. Pizza is on the club! Just buy your own drink. Everybody is invited! Come meet other club members, check out what’s new. * Free food (on the club), but buy your own drink. - Take the Capitol St. exit. - Loop around the exit ramp to the right and get on Capitol St.
- Cross Barbur Blvd. plus one more set of traffic lights. - Turn right into a driveway just in front of a motel. - The Round Table Pizza is right behind the motel. - Get onto Barbur Blvd. and follow it up the hill, over the crest. 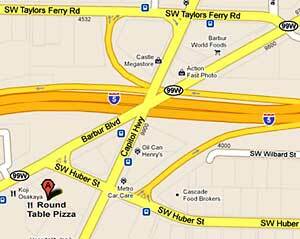 - Turn right into driveway for the Round Table Pizza and a Chinese restaurant (or is it Japanese? ), just a few feet before McDonald's. Location: Round Table Pizza, 10070 SW Barbur Blvd, Portland, OR. 7:00 pm -- Meeting starts. Pizza will be served; drinks on your own. Usually on the last Monday of the month. April 29, 2019. (Monday) - Usually the last Monday of the month. 6:30 pm - formal meeting. Location: Round Table Pizza, 10070 SW Barbur Blvd., near Capitol Hwy. (by McDonald’s). This is an organizational and planning meeting, attended mainly by Board members, trip leaders, activity organizers etc., but it is open to all. Anyone wanting to get more involved with the club is welcome. Normally, up till now, we have waited with trip signups until July 1st, for our new fiscal year. But this time, we are making an exception! We will announce and open up our trips signups a month earlier, on May 30th. One day only, at this annual Social and Elections night, you will also be able to sign up early for our ski trips! So, bring a check for a trip deposit! 7675 SW Capitol Hwy., Portland. See Google Map. Food will be on the club. Just buy your own drink. * Participate in electing our club officers. * Early bird TRIPS signups! ELECTIONS: We will hold our annual club elections on this day, for President, Vice-presdient, Secretary and Treasurer. You can nominate someone and/or vote either by mail or email by sending your vote to info@mthigh.org, or vote in person this Thursday evening. Please send in your nominations right away to info@mthig.org. We are still open for nominations. If anyone else wants to run, please notify our elections coordinator and past club president: Kurt Krueger at telek2@frontier.com or 503-625-1492. We have several appointed positions on our Board now: Social Activities Director, Trip Leaders, Newsletter Editor and Race Coordinator for Mt. High. We especially need a Social Activities Director and Trip leaders. Please let us know if you are interested in running for one of these 4 main Board positions, or for our vacant position as Activities Director, or possibly an additional Trip Leader. If you would like to be a “Board Member at Large”, talk with Debbi Kor (our club president) about what you may have in mind. Please RSVP if you are planning to come. Ballots will be available at the door. If you are unable to make the meeting, please fill out the enclosed ballot and email it to Kurt Krueger at telek2@frontier.com. Due date for mailed or emailed ballots is May 27. It's also possible to mail it to our PO Box 2182, Portland, OR 97208,, but please make sure it arrives by May 27th. (All other Board positions are assigned by the President). If you are interested in running for a PACRAT Board position for 2019-2020, please contact Peter Dodd at president@pacrats.org. Please provide information on what position you would like to run for and why you are interested in doing so. He will be assembling the ballot. You will need to be at the meeting to say a few words about why you'd like to run and what you plan to do, or have someone else show up and speak on your behalf. .
June 19, 2019 (Wednesday) - 6:00 pm. A multi-club meeting, attended by representatives of several local ski clubs.. At least one representative from each club should attend. But also, the meeting is open to all club members. Pizza will be provided; beverages no host. The focus of this meeting is ELECTIONS; both for NWSCC and PACRAT. Come learn the latest about what NWSCC is doing! Join the leadership of the Council – serving on the board of directors is a great way to get involved in club, council and Far West Ski Association activities. The board is made up of members from different clubs in NWSCC—bringing a variety of style and experience to the Council. 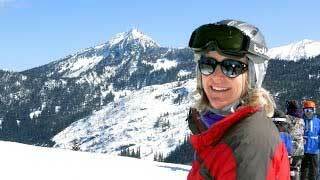 President: Head of the Council Executive Board; represents NWSCC at Far West Ski Association board meetings and at National Ski Council Federation meetings. Treasurer: Responsibility for Council financials. Experience with bookkeeping software and GAAP necessary. If interested, please contact President@nwskiers.org for more information or to put your name on the ballot. We need your input and support, and want YOU to consider serving on the Board! Total visits from Oct.1, 2005 -- Sept. 30, 2006 was: 2,798. Total visits from Oct.1, 2006 -- Sept. 30, 2007 was: 3,267. Total visits from Oct.1, 2007 -- Sept. 30, 2008 was: 6,037. This web site is hosted by 1&1 Internet Inc.
Want you own web site, your own domain name? Try 1&1. It's affordable and reliable.